More than a decade ago, Suzuki developed a machine so unique that it instantly attracted a devoted following around the world. Like its namesake, the Japanese peregrine falcon, the Hayabusa is famed for cutting through the air with incredible agility and performance. Through countless engineering refinements of the original design, the Hayabusa spirit has endured. Its incomparable performance delivers a fun and sporty ride at any speed, setting the bar high for rivals and defining the "Ultimate Sport Bike." 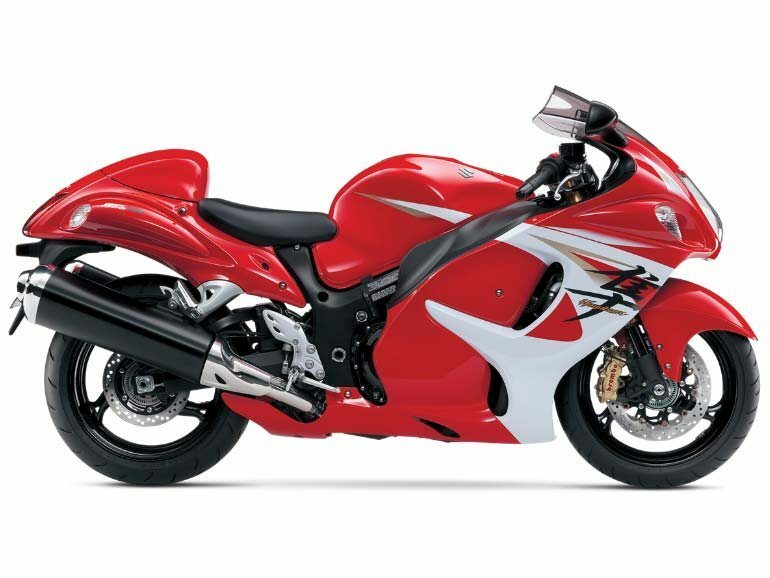 The radically original yet timeless styling also reflects the spirit of the person who owns a Hayabusa. Its sensational power, speed, smooth ride and overwhelming presence continue to fascinate owners and onlookers alike. Because the Hayabusa is, and always will be, the ultimate sport bike. The 2014 model comes newly equipped with Brembo Monobloc high-performance calipers and an Antilock Brake System. These features are sure to appeal to lone riders cruising the highway as well as touring couples. The Hayabusa's instrument cluster features four analog meters for speedometer, tachometer, fuel gauge and water temperature with an S-DMS mode indicator, gear position indicator and adjustable engine-rpm indicator. Vertically stacked twin headlights provide increased light intensity, improved light distribution and match the elegant flow of the Hayabusa styling. The tire's profile and compound were developed through a variety of testing to achieve a high level of stability and handling. A lightweight and rigid twin-spar aluminum frame minimizes weight while maintaining high torsional strength. KYB inverted cartridge forks feature a Diamond-Like Carbon (DLC) coating surface treatment on the 43 mm stanchion tubes to reduce friction and increase reaction to small surface irregularities. Spring preload, compression damping and rebound damping are fully adjustable. A bridged aluminum alloy swingarm features a cross-sectional shape for increased rigidity, which also helps cope with improved rear tire grip and increased engine output. The Hayabusa's fully adjustable rear shock absorber has a 43 mm piston and 14 mm rod diameter. A 1,340 cc in-line four-cylinder fuel injected, DOHC liquid-cooled engine with 16-valves and Twin Swirl Combustion Chambers (TSCC) provides phenomenal power and broad torque delivering breath taking acceleration. Lightweight aluminum alloy pistons with a compression ratio of 12.5:1 are used for maximum performance in all conditions. Hard, smooth chrome-nitride Physical Vapor Deposition (PVD) coating on the upper compression and oil control rings on each piston reduces friction while improving cylinder sealing. Suzuki Composite Electrochemical Material (SCEM) cylinder plating improves heat transfer, durability and ring seal. Lightweight titanium valves allow the use of light valve springs and high lift while maintaining accurate valve control. Iridium spark plugs are used for high combustion efficiency. Curved radiator with a compact, dense-core design and engine-management-computer-controlled two ring-type electric fans mounted on the rear of the radiator, increasing the control accuracy and keeping engine temperature stable. The Hayabusa's engine is fed by tapered, 44 mm double barrel Suzuki's SDTV (Suzuki Dual Throttle Valve) throttle bodies utilizing dual 12-hole, fine-spray injectors per cylinder and ram air intake with large volume air box. This precise, carefully controlled system improves combustion efficiency results in improved power delivery and a more linear response. Idle Speed Control (ISC) system improves cold starting and helps maintain stable engine idle under various conditions. Suzuki Pulsed-secondary AIR-injection (PAIR) system ignites unburned hydrocarbons and reduces carbon monoxide emissions. S-DMS (Suzuki Drive Mode Selector) allows the rider to choose from three different engine settings depending on riding conditions or rider preferences. An optimized six-speed transmission features oil spray to the 4th, 5th, and 6th gears to reduce wear and mechanical noise during highway cruising. 12 month unlimited mileage limited warranty.